Will we ever see more of modern day SkyClan? I don’t know! They were never really my Clan – in fact I have never written about them until Dawn of the Clans. They very much belong to Vicky and Cherith and I don’t know if there are any plans to bring them back. I just thought of a question really. And I probably wouldn’t of been able to think of it unless I’d seen this comment under a picture of Gorsepaw. Which makes me wonder. Do you think Morningflower was Tallstar’s mate? And that Gorsepaw was their son? I never really thought of it until that comment. I mean it doesn’t show it in Tallstar’s Revenge, but later it could have happened right? What do you think, Kate? Tallstar never took a mate. His heart always belonged to his Jake. I would be interested as well in your favourite junk food. And I would like to know if we ever find out where Sol came from and where he went to. Favourite Junk Food?? It’s ALL good. I love crisps (chips) better than chocolate. I’d happily munch my way through the whole snack ailse of the supermarket. No. He was a fabulous drifter. Knowing where he came from, and where he went, would spoil an essential part of his nature. 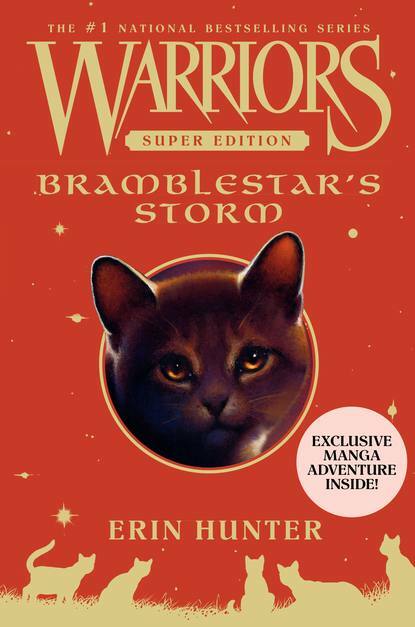 If there are any more Super Editions after Bramblestar and Mothflight, which character would you like to write about the most? I suspect that one is being planned right now for 2016. It’s Cherith’s turn to write it. I’ll let you know what it’s about as soon as I find out. I’d love to write one about Leopardstar. But that’s a bit old-school now. From the current series, I’d be most interested in River Ripple. There’s something mysterious and secretive about him, and he’s a lovely character. Is Gray Wing going to have another mate? I was wondering if you could reincarnate Turtle Tail because she gets a important role and needs to be put back to life, but she knows that she used to be Turtle Tail even though Gray Wing doesn’t and it comes out as a big surprise. Did you do a lot of research on cats before you wrote the books, or did one of the authors do it? Or did you just wing it, all of you having cats and all, so you based the books on what you knew? 131 Responses to "Kate Answers Questions: Junk Food and Super Editions"
Hi Kate big fan of your warrior series expecially the orginal one. My parents had to ban me from reading it for a year because that was the only book that i kept reading anyway here is my questions. Will Bramblestar and Squrrielflight ever have there own kits? Also why did you make a tree kill Firestar? i mean i was going to be preety sad about his death but i thought it would be more epic. Like a death match not a branch killing him! Anyway can’t wait to read more. I can’t tell you what’s going to happen in future books, but the Firestar death thing – i think we just couldn’t let Firestar be killed by Bad Cats! It would just be wrong for Evil to triumph over Good. But Firestar HAD TO DIE. Destiny and stuff. Does Gray Wing really have to get another mate? Why can’t he just remember Turtle Tail and wait for her until he reaches star Clan? I have to say he’s been a bit of a romantic tragedy (which has been good to read actually, and it is often funny how clueless he’s been), what with only loving other cats who are another cat’s mate…and then they die. All of them. And being oblivious about Turtle Tail until she had kits. But I really loved that he finally found happiness with her, even though she died. I just don’t think it’s necessary to give him ANOTHER love interest. Hasn’t his heart been through enough? Why is it never okay for them to just wait until they can see their love again in death? I don’t think we need another Crowfeather situation again… Anyway. Besides, he already has plenty of foster kits to raise and love as his own. I hope Berrynose chooses Poppyfrost, I’ve always loved her, and she did have his kits, plus he and Honeyfern aren’t even mates anymore! I’ve wondered the same thing about Graystripe, will he choose Millie or Silverstream! They already said that he would meey silverstream in starclan. That’s why millie was, protective? What about having a dog raised in the clans, thinking he is a cat, once he learns the truth his loyalty is tested. Kate, in Tigerclaws Fury, Rowanberry is still a warrior of Shadowclan, but in all the previous books that came before Tigerclaws Fury, Rowanberry is not in the allegiances! And Nutwhisker is not in Tigerclaws Fury, what happened to him? I have a quick question. When did Moth Flight’s Vision come out? I haven’t seen it in bookstores, or even on Amazon! It hasn’t come out yet I dont think! I feel like it comes out in November, but I’m not sure!